Can you remember when you first learned to drive? Remember how surreal it was to be in control of a vehicle that was moving so quickly? Perhaps you were a nervous driver at first, or maybe it was easy, it felt just like breathing. We don’t often give ourselves credit, but driving is pretty difficult. It takes the perfect blend of both mental and physical abilities to drive a car. At this point it is probably second nature to you, but just as you had to learn to walk, talk and swim, you once had to learn how to drive a car. And just as you might run into something if you try to walk without looking where you are going, if you try to drive without paying attention, you are likely to have a collision. The only difference is that, in a car, you are going much faster. Driving requires three things: your sight, your hands and feet and your mind. Take one of these away, and you can understand why you automatically become a worse driver. That is why there are three main types of distracted driving, as defined by distraction.gov – manual (taking your hands off of the steering wheel), visual (taking your eyes of the road), and cognitive (taking your mind off of driving). 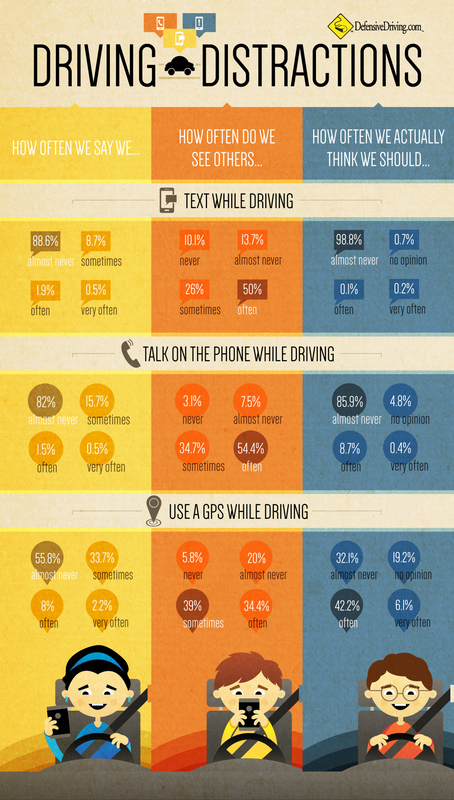 This infographic has many other surprising statistics regarding distracted driving, but what can we learn from it? Most of us realize that we shouldn’t be talking on the phone or texting while driving, but far fewer of us will take responsibility for doing so. The high number of traffic fatalities from distracted driving tell us that this is a real problem, so it’s time for us to step up and take responsibility for it. Your decision to put down your phone before you drive could save a life, and that life could be yours.